The first snow. Lights on trees. A family dramedy headlined by Diane Keaton. These are the traditional signs that the holiday season is rapidly approaching. In Love The Coopers, Keaton again plays the matriarch to a harried brood of neurotic, over-stressed adults, and cute, precocious children. 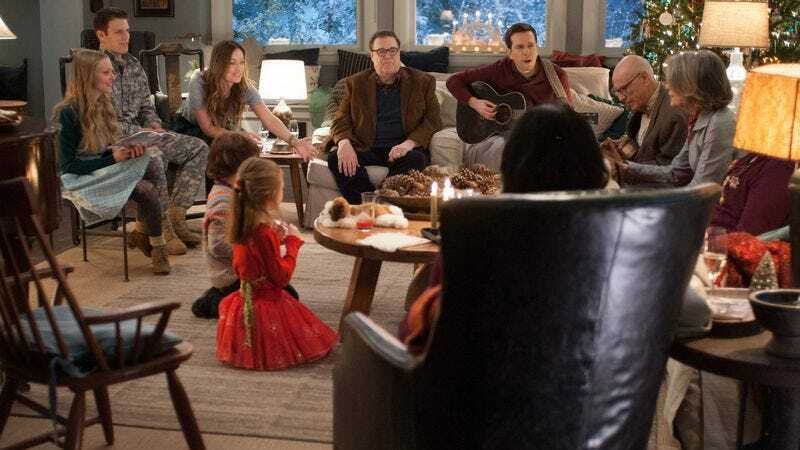 When the Coopers get together for Christmas Eve dinner, everyone has their own issues to bring to the table, including single dad Hank (Ed Helms), kleptomaniac Emma (Marisa Tomei), and Eleanor (Olivia Wilde), who recruits a recent army vet (Jake Lacy) to pretend to be her boyfriend for the evening. Rounding out the eclectic cast are John Goodman, June Squibb, Amanda Seyfried, and Alan Arkin. Love The Coopers gets a jump start on the holiday season when it hits theaters on November 13, but The A.V. Club and CBS Films have an opportunity for you to see it on November 9 for free. For your chance to win a pair of passes to the advance screening, simply follow the link here and enter your information. Remember: Advance screenings are often intentionally overbooked, so be sure to arrive early if you want to guarantee yourself a seat. An official plot synopsis and trailer for the film can be found below.